HE TWO-WEEK season known as “Passiontide” traditionally begins today. This is the period of proximate preparation for the Paschal festivities. It is marked liturgically in a number of ways. In the Ordinary Form and the Extraordinary Form, for example, this is the time during which sacred images are veiled in the church (with the exception of the Stations of the Cross). In the Extraordinary Form, Passiontide is further distinguished by the suppression of the Gloria Patri and the omission of the Judica (Psalm 42) at Mass. Lord, holy Father, almighty, eternal God. Through whom the Angels praise your majesty, Dominions adore, Powers tremble. Heaven and the Virtues of heaven, and the blessed Seraphim, unite to celebrate together with exultation. The bold sections above are the heart of this magnificent preface, most likely authored by the great eighth-century liturgist, Alcuin of York. 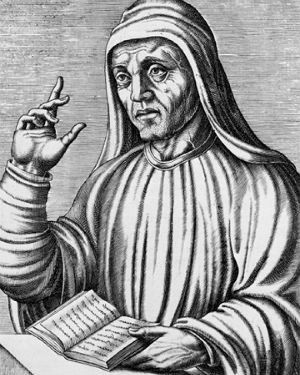 Our first extant source for this text is the Masses of Alcuin. 2 Among this collection of 278 Masses, Deshusses identifies 223 formularies that are simply borrowed from other sacramentaries or that can be found only in one or two MSS. From among the remaining 55 Masses, Deshusses highlights a subset of 21 or 22 that, on account of their homogeneous structure and style, ought to be considered the authentic work of Alcuin, either as editor or as author. 3 Structurally, these formularies are distinguished by their inclusion of the three standard orations, possibly a preface, and a super populum. Stylistically, the choice of words is marked by high refinement and an affinity for elegant comparisons and inversions. The votive Mass “De Sancta Cruce” is among this special subset, and it includes the preface that remains in use verbatim in Missale Romanum 2008 for both the feast of the Exaltation of the Holy Cross (September 14th) and the votive Mass “De Mysterio Sanctae Crucis.” (See also this short history of the feast of the Exaltation.) In Missale Romanum 1570 (and MR 1962), this is the same preface used during Passiontide. This preface contains rich scriptural allusions. 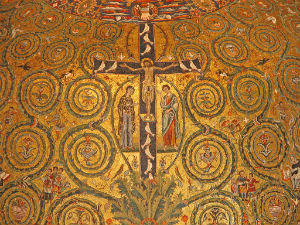 The statement, “qui salutem humani generis in ligno crucis constituisti,” alludes strongly to the following Gospel passage: “And as Moses lifted up the serpent in the wilderness, so must the Son of man be lifted up, that whoever believes in him may have eternal life” (John 3:14-15, RSV). These verses, in turn, recall Numbers 21:5-9, wherein the Israelites who had been bitten by fiery serpents are healed by looking upon a bronze serpent lifted up on a pole. It is a beautiful and essential feature of this story from Numbers that the people were healed by means of the same instrument by which they had been struck, namely a serpent; the preface capitalizes upon the same device, extending the imagery to the tree of paradise and the tree of Calvary. Another scriptural reference apparent in the preface is the phrase, “qui in ligno vincebat, in ligno quoque vinceretur.” 4 The preface text does not specify the subject of this phrase, but scriptural context reveals it to be Satan, who defeated Adam and Eve in the garden of Eden (Genesis 3). By whom or what, however, was Satan, himself, conquered on a tree? Scripture answers this question, too, where Peter observes that “he, himself [Christ], bore our sins in his body on the tree, that we might die to sin and live to righteousness” (1 Peter 2:24, RSV). The Church offers so much for our reflection during the season of Lent, and the offerings are raised to an even richer register during Passiontide. Let’s not miss the powerful message of this beautiful, ancient, and eloquent preface. 1 Missale Romanum ex decreto sacrosancti oecumenici Concilii Vaticani II instauratum, auctoritate Pauli Pp. VI promulgatum, Ioannis Pauli Pp. II cura recognitum, editio typica tertia, reimpressio emendata (Vatican City: Typis Vaticanis, 2008). 2 Le Sacramentaire grégorien: Ses principales formes d’après les plus anciens manuscrits, édition comparative, vol. 2, ed. Jean Deshusses (Fribourg, Switzerland: Éditions Universitaires Fribourg, 1979), 1837. See also Edmond Moeller, Corpus Praefationum, CCL 161C (Turnhout: Brepols, 1980), 1200. 3 Deshusses, vol. 2, 25-26. 4 A very similar thought is expressed in a homily of Theodore the Studite: “ἐπειδὴ τὸ πρὶν διὰ ξὐλου τεθανατὠμεθα, ὲν ξύλῳ τὴν ἀθανασίαν εὑράμεθα · ὑπὸ ξύλου χατασοφισθέντες τὸ πρότερον, ἐν ξύλῳ τὸν σοφιστὴν ὄφιν ἀπεχρουσάμεθα.” Theodore the Studite, Oratio in adorationem crucis, in J.-P. Migne, Patrologia Graeca 99: 696.